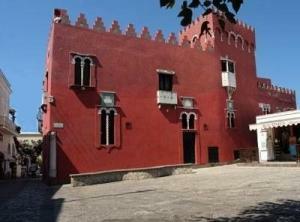 One of the prominent tourist attractions on the island of Capri is the Casa rossa (Red house) in the town of Anacapri. It is more than red; it is Pompeian red and stands out prominently on the main pedestrian thoroughfare in Anacapri. It is a glaring architectural hodge-podge of pseudo-Norman/Arab mullioned windows, a porticoed courtyard, a non-watchtower and some swell leftover crenels and merlons. It would be at home in Las Vegas. It is—at least in intent— perhaps similar to the nearby villa of Axel Munthe*; that is, it is what you might expect of someone from abroad who falls in love with the island and its classical heritage and sets out to buy as much of it as he can and build a house in which to display it all. That someone was John Clay MacKowen. MacKowen (1842-1901) was one of the children of John McKowen [variant spellings are accurate; the son spelled his surname differently from the rest of the family], an 1830 immigrant to Louisiana from Castle Dawson, Ireland. John Clay MacKowen served as a Confederate lieutenant colonel in the 15th Louisiana Cavalry Regiment in the US civil war. His brother, Alexander, was killed at the battle of Vicksburg. MacKowen graduated from Dartmouth College in 1866, became a doctor and practiced medicine in Jackson, Louisiana where he was appointed to the board of administrators of the insane asylum. He also studied the causes of yellow fever and contributed greatly to the battle against that disease in Louisiana. Beginning in the 1870s, MacKowen spent much of his time in Anacapri on the island of Capri. He bought a number of properties including the Blue Grotto and the adjacent Roman imperial villa of Gradola. (It sounds like a joke. I, myself, once bought the Colosseum in Rome from a friendly guide, but.... In the days before mass tourism, places such as Capri were hard-scrabble farming communities always strapped for money. Maybe you really could just walk up and ask, “Say, how much y'all want for that Blue Grotto over there; oh, and I’ll take one o’ them Roman villas, too!”) Many of the classical fragments that MacKowen found in that area he then moved to the Casa rossa, the home he had built for himself in the town of Anacapri where they are today part of the classical items on display. He was also an avid collector of rare books and manuscripts and traveled widely in Europe, Africa, and Asia. He lived in Anacapri until 1899 and then returned to Louisiana where he died in 1901. Besides the classical items on display within the Red House, there is an art collection on permanent display entitled “The Painted Isle,” a collection of 32 canvases from the 1800s and 1900s dedicated to the island of Capri. My intuition that MacKowen and Munthe had something in common has been vindicated! 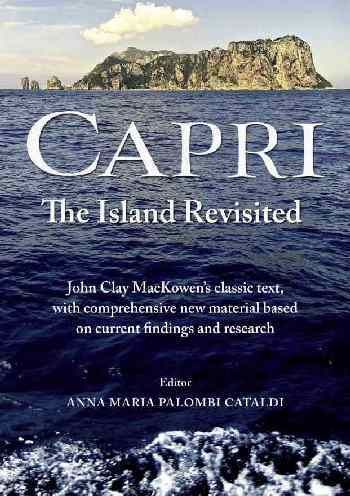 I've just had a look at a recent publication: Capri, The Island Revisited, John Clay Mackowen's classic text, with comprehensive new material based on current findings and research, published 2012 by Beaconsfield Publishers in the UK. The work is a republication and expansion of Mackowen's original book entitled, simply, Capri, published in 1884, a work that Norman Douglas praised, frustratedly, in 1952 with the words "...[the work] is so scarce and informative that it deserves to be reprinted, this time, let us hope, with an index." He would like this edition. The two men detested each other, and on one occasion an argument about a newly unearthed statue led to a challenge to a duel, though it never took place as they were unable to agree on the choice of weapon. I'm glad they didn't kill each other since that might have interfered with the publication of at least four good books about the area: Munthe's own The Villa of San Michele; also his powerful Letters from a Mourning City about the cholera epidemic of 1884 in Naples; then MacKowen's original Capri, indeed informative and a good read, and, finally, this republication, the new material in which updates and balances the original text across more than a century; together the two parts constitute a worthwhile addition to literature about Capri. I am always wary of new books about Capri. It's a crowded field, but if you think about it, it's crowded with pamphlets, postcards and guide books, but not necessarily good books, and there is always room for one of those. This one is good. MacKowen's original text covers 120 pages in this edition (I'm guessing 50,000 words) divided into seven chapters: Geological; Topography and Climate; History; Why Tiberius came and remained in Capri; History during the Middle and Modern Times; Habits and Customs; Description. ...the hatred between the people of Capri and Anacapri is as strong now as it was centuries ago. ...The young men have provided themselves with sacks of sweetmeats, and during the meal throw them at the young women, the prettier the girl, the more sweetmeats she receives in her face...she throws them back and a general war ensures..."
[...In those days...] There was no butcher, and beef could be obtained only when a cow had the misfortune to fall over a precipice and find an untimely death; whereupon, a herald with a trumpet announced to the people that a cow had been butchered and that the meat was for sale in the Piazza. As with most things you read, what you like generally tells you something about yourself. Without being overly self-analytical (and, no, don't send me your analysis of me, either!) I was attracted to a five-page segment in MacKowen's original text about the presence on the island of a grotto temple to the Persian sun-god Mithra. I knew of one in Naples, but I had never heard of the one on Capri. It is near the natural arch in a part of the island called Matromania, itself a name that is likely a corruption of Magno Mithrae antro (chamber of the great Mithra). So I learned that fact, yes, but I also had a chance to watch MacKowen expand that fact into an exquisite short essay on the fall of Mithraism and the rise of Christianity in the late Roman Empire. So whatever you don't do, don't take this book to Capri with you or you'll wind up staying in your hotel room and reading it! The new material that amplifies the original book consists of 80 pages of text and illustrations, divided into six essays about MacKowen and/or the island: An Adventurous Life; The Geology of Capri, a noble endeavour; It all began with Cave-dwellers, MacKowen and the ancient history of Capri; John Clay MacKowen, an archaeologist in Capri; From Capri to the Mainland, an island on the fringes of a capital; and Looking Beyond, MacKowen and habits and customs of the island. Those who arrived in the nineteenth century now endeavoured to look beyond appearances and capture the realities that lay beneath ordinary life. John Clay MacKowen was not merely one of this enlightened group. He was an established member of the foreign colony on the island whose houses had been built or adapted into museum-homes in the style of the period, and who — in many case — married local women. During his years on Capri, he came to acquire a profound knowledge of the territory, and from his cultivated background was able to comment with perspicacity on the habits and customs of the local people amongst whom he lived. ...visitors to the island...each in their own way and according to his or her literary or artistic abilities...[have taken] note of and praised the island girls and indeed this may be one of the features which most served to spread the legend of Capri. So far no alarm bells other than one that tells me I should pay closer attention to certain things. Then I glanced at the date the item appeared in the NYT—August 24, 1884. That is the same year that MacKowen's book was published. If you don't believe in coincidence, please tell me what that means. MacKowen swings easily between accurate archaeological, historical, philosophical, naturalistic and geological disquisitions, supported by scholarly citations, and lighthearted anecdotal accounts that take us back to a period when romantic idealism was rapidly giving way to a desire to apply the scientific method to every sphere of knowledge and human life.